P.J. 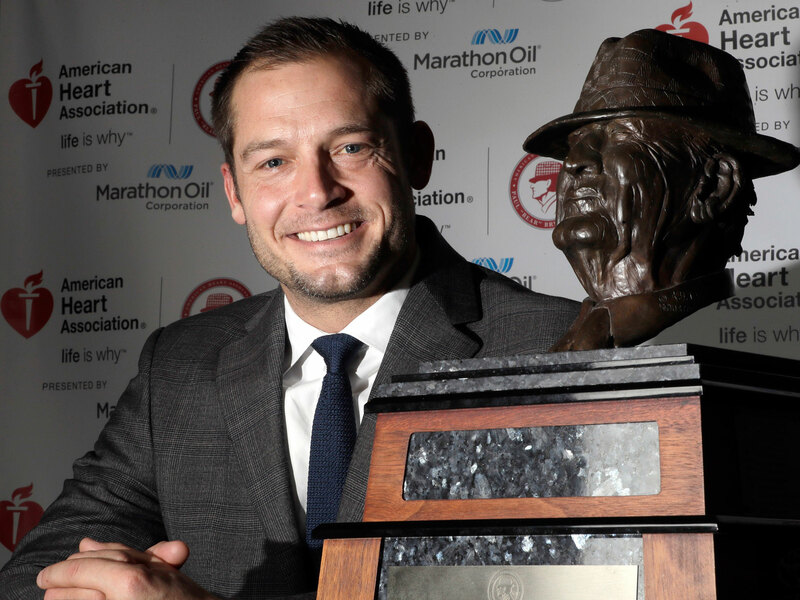 Fleck, entering his first season as the head coach at Minnesota, put all his enthusiasm and passion on display as the Big Ten coaches met the media. CHICAGO — One day last spring, just a few months after he accepted the head coaching job at Minnesota, P.J. Fleck arrived at a dodgeball match with some of his players. Not only was the coach going to compete, he was also dressed for the occasion: short shorts, a tank top, elbow pads, knee pads, a pair of rec specs strapped around his head. The 36-year-old has more energy in his left pinkie nail than most of us do in our entire bodies. He’s a walking advertisement for the University of Minnesota, and his manner of speaking is as fervent as it is fast. On Tuesday, he debuted a nearly shaved head—the product of a lost bet, an emerging hair “peninsula” and a buzz in a bathroom at Disneyworld—and a perfectly tailored suit in a plaid of brown and Minnesota maroon. Last year’s Group of Five darling has gone dapper, with a tie and pocket square to prove it. He opens his media session by telling his kids to stop hitting each other, because he knows this is all televised, and they’re watching, and at this point, who wouldn’t listen to Fleck if he told them what to do? In 2016, Fleck remarried. His wife, Heather, has had one piece of advice for him since she’s been by his side: Be yourself, Fleck recalls her telling him, just like Jim Harbaugh. “Harbaugh is not for everybody, and I’m not for everybody,” he says—except that so far, he seems to be college football’s favorite phenomenon. Since taking over at Minnesota, it’s been a nonstop quest to build cultural sustainability (his words) for a team that’s seen three coaches in as many years. And if anyone can build a culture, it’s Fleck. Talk to him for 10 minutes, and you start to wonder if maybe you might have some eligibility remaining to walk on to the Gophers. It comes naturally, selling the college football world on what he’s building at Minnesota, but as Fleck said Tuesday, the “honeymoon stage” is ending. Still, he’s going to squeeze every ounce of charm he can get out of it. In his opening statement Tuesday, Fleck introduced the three players he brought with him to Chicago. He didn’t mention a thing about any of their on-field talents. Rodney Smith? He’s a guy people enjoy spending time with. Richardson has a skinny waist to go with his massive torso; it’s hard for him to find a good suit. And Celestin, his father just passed away. That they’re good at football is a fact Fleck seems to overlook, or concede we all know—or maybe in this case it’s just irrelevant. Here, he’s building personality. He’s already built a roster. Fleck is aware he’s putting on a show. He talks as if he could keep going for hours, about topics ranging from a claim that he couldn’t read in third grade to the Kardashians to his love of ancient Rome. He’s a novelty to everyone but himself. “What seems different for you,” he explains, “does not seem different for me.” And though he expressed he might have picked a different name for his reality show, it seems ESPN aced it. This isn’t so much Fleck selling Minnesota or Fleck drumming up press. It’s merely Fleck… being P.J. Fleck. And there you have it, the gospel of the football coach in elbow pads, the boat-rowing, barely caffeinated force that’s just hit the Big Ten.